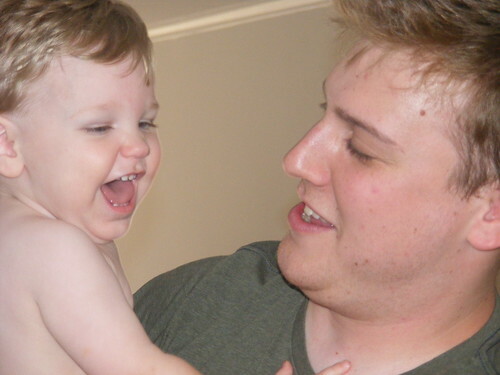 It’s hard to believe that I have a one year old. A walking, semi-talking, little person. Alex had a wonderful Birthday and Birthday Party. We went to a nice little Italian restaurant on his Birthday and he enjoyed eating tons of white bread and tortellini. Seriously, he ate about a pound of bread. It was impressive. 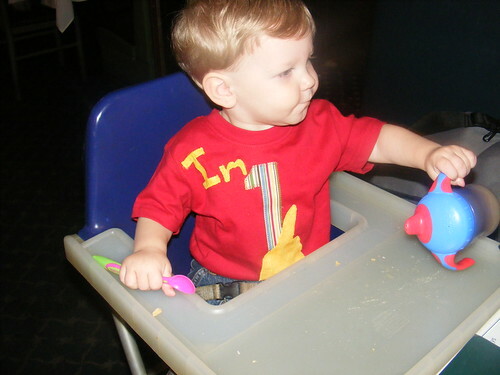 Wearing his “I’m 1” shirt, made by the wonderful and talented Karen, everyone knew without asking how old he was! At lunch the next day, a (clearly naive) waitress asked, “How old is he? Three or four months?” I almost laughed in her face, but refrained and answered her nicely. By the end of the afternoon, Alex was exhausted. He had played with everyone for hours, had cake, opened presents, and played some more. He took a nice two hour nap while some cleaning was able to occur, and was refreshed and ready to play some more when he woke up! All in all, the Birthday madness was a success! 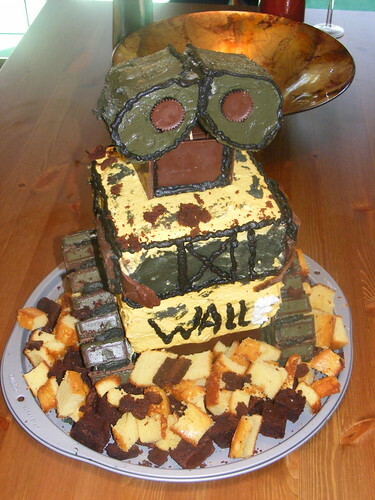 ← Wordless Wednesday: Mmm… Edible Wall-E! Looks like you guys had a terrific day. One is a special birthday. I remember being so excited when we had our daughters first birthday. I was like a big kid. I loved the cake. It turned out great. 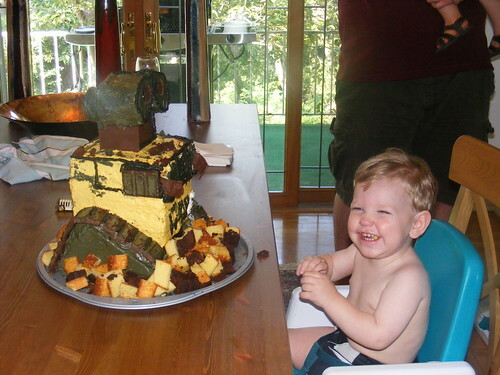 Wow… that cake is amazing. Happy birthday do your handsome little guy. Wow, what a super cake! That cake is so cute! And of course, so is that little boy! Congratulations, glad you all had a great birthday party! The cake is awesome! Okay, so what do I have to offer Big D to come make cakes for my girls’ birthdays? I just saw the mention of cake on Plurk and had to check it out! Our little guys are about the same age–your cutie has way more hair *sigh* J was actually due on the 9th and came a month early. That cake is awesome and Alex is a doll!!! Congratulations! Aren’t they a blast! That is the most clever cake I’ve ever seen!!! I love it 🙂 And I’m sure it was a total hit. One IS a big deal for you and for baby. Congratulations on 1 year!